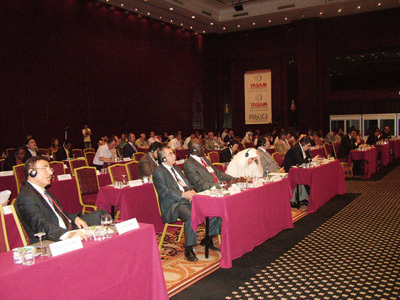 The SESRIC together with the Turkish Asian Centre for Strategic Studies (TASAM) co-organized the “Congress of Vocational and Technical Education in Islamic Countries” which took place on 18-20 June 2009 in Istanbul, Republic of Turkey. The congress was held with the high-level participation of the Ministers and Deputy Ministers of Education from OIC Member States, Director Generals of TVET Institutions, specialised NGOs in the field and academics from various universities. H.E. Dr. Savas Alpay delivered an opening statement during the inauguration session of the Congress where he characterised this event as a welcome opportunity to underscore the pre-eminent place of cooperation in vocational and technical education and training as it addresses a very important priority issue within the OIC family in a world where the phenomena of globalisation, food and water scarcity, global warming, and climate changing requires new types of graduates and adoption of our education and training systems for all programmes, and the emergence of knowledge society and prevalence of economic uncertainties have tremendously increased the complexity between education and the diversified skills that labour market needs. He further stated that the biggest challenge of our time and future will be to establish a sound match between vocational and technical education and training and employment. Given the fact that in most OIC Member Country there are imbalances that have developed in our education and training systems, the challenge still remains as to tailor our education and training system to the needs of the economy and the labour market’s capacity. To face these challenges and to overcome the difficulties before our socio-economic efforts we need to take precautionary measures in order to generate more wealth and prosperity in our countries. He further stressed that establishing closer and stronger partnerships among OIC Member States in our efforts in vocational and technical education and training is of utmost importance. In this context the Vocational Education and Training Programme for OIC Member Countries (OIC-VET), that was originally proposed by the SESRIC and adopted by the OIC Member States in the 24th Session of COMCEC is an outcome of the idea of fostering coordination and cooperation among all Member States to improve the quality of vocational education and training in the public and private sectors with the aim of supporting and enhancing the opportunities for individuals to develop their knowledge and skills and thus to contribute to the development and competitiveness of the economies of their countries. H.E. Dr. Savas Alpay concluded his statement expressing his sincere believe in the success of the Congress towards serving our coordination and cooperation prospects by generating an opportunity to discuss effective ways of improving the quality and capacity of vocational and technical education and training systems, networking of the initiatives in the Member States, particularly for vocational guidance and promotion and use of information and communication technologies in vocational training, as well as enhancing innovative vocational training approaches. The meeting can help bring greater coherence to our collective efforts and can gear those efforts towards the realisation of the partnership for training, as set out by the OIC-VET Programme. A presentation was made by Mr. Mehmet Fatih Serenli, Director of Training and Technical Cooperation Department at SESRIC, entitled “Vocational Education and Training Programme for OIC Member Countries: A Novel Programme towards Multilateral Cooperation” where he briefly introduced the OIC-VET Programme, and elaborated more on the distinctive features of the Programme and its intended impact and legacy for the Member States. He stressed on the fact that while respecting the responsibility of the Member States for the content and implementation of vocational training, the OIC-VET Programme supports and supplements the activities of the OIC Member States. It aims at improving the competencies and skills of the people according to the needs and priorities of labour markets through intra-OIC partnerships at institutional level. The Programme focuses on increasing accessibility and raising the quality of vocational education and training, and provides an opportunity for organizations involved in vocational education and training to build OIC partnerships, exchange best practices, increase the expertise of their staff and develop the skills and competencies of the participants. These objectives, which are at the very core of vocational education and training efforts in Member States, call for more effective and coherent training cooperation. During the deliberations by the country representatives, an assessment of vocational and technical problems at the education systems of member countries of the OIC was covered, their current status was articulated by experts and more importantly, a common vision for the future was attempted to be determined on core areas such as exchange of qualified staff, cooperation and assistance.